We drove through Kathmandu. Over rocky roads, narrow streets, and busy ways filled with motor cycles. Honking all the time. I was sitting on the backseat of the car. 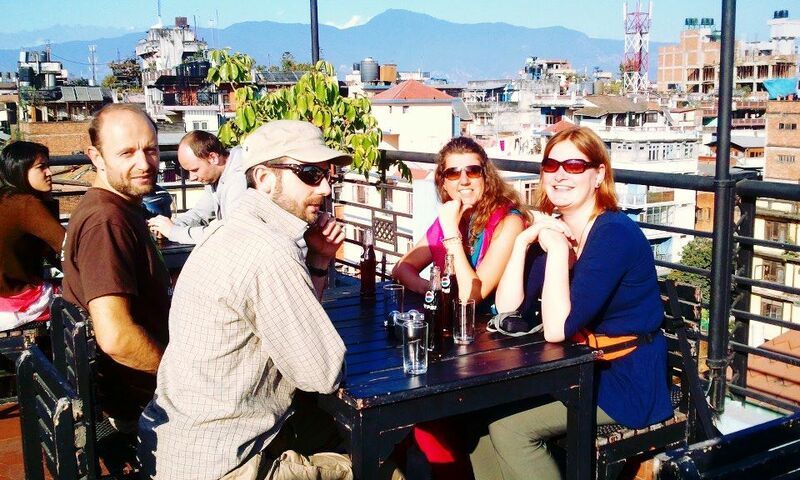 It was my first day in Nepal, and like a sponge I tried to absorb everything I witnessed. Of course I failed, it’s impossible to understand the 8th step if you’re only at the first. But I tried. Despite this knowledge I tried. Because of eagerness, curiosity and the wish to understand. Our goal was the conference building. The place were the magic was suppose to happen. The place where the world would be gathering (well, at least some of it) to share experiences about how to create a healthy world. But like I said, I was only at the first step on that moment in the taxi. I didn’t know one single thing. Of course I read some articles, and I can honestly say I have an open mind. I experienced our KeepitCleanDay in the Netherlands, and I walk around on this planet for 36 years. But every new experience needs a new born spirit. A way of openness to see the world with the eyes of a child. We entered the building. A big building. Colored grey and with several floors. We walked around, looked at the rooms that were supposed to be filled with liveliness and energy the next following days. We looked at each other. Kaia- Kaire, Pille, Taisto, Nara and me. All born in Europe, but in different countries. In different places, with different backgrounds and different hearts. And there we were: In the middle of this big grey building. Ready to start this 4 day conference with enthusiastic people from all over Asia. I tried to blend in. Into the building, into the energy I felt, and the others who would soon became me new friends. Our meeting with the Greenaction (Nepalese organization) started and I entered a new world. In this formal chair, with this formal table and the formal cup of coffee I was amazed minute after minute. You see, before I went to Nepal, I promised myself one thing. I promised myself not to hide for anything, to be as sincere as I can be, and to share my own perspective, even when I knew that I was only at the first step of this journey. Because also our first steps are valuable. They cherish this chemistry in them that you only experience if you’re starting something new. A balance between being excited about adventures in the future, and the fear of not-knowing. Before I went to Nepal I promised myself to embrace these first steps and to value it, just as I value it when I see it in others. So there I was. Sitting in this formal chair. Being amazed about the situation. Minute after minute. Three persons from Estonia, one from Slovenia, four from Nepal and me, were trying to put together a program full of lectures, presentations and workshops. I witnessed the look up on everyones face, and I saw how we all did our best to open up to each other. Even it was difficult sometimes (the conference program changed more then fifteen times..), I could feel the energy of the wish we shared to make this conference happen. I could see we all tried to make it work. To let the magic enter. To materialize our collective wish. And we did. We did succeed. Four days later, after a wonderful conference with tons of impressive and heartwarming moments, we sat together in Taisto’s room in the Hotel ‘Family Home’. His room was set up to also be our ‘Ohviss‘ (office) and lounge. Every night after a conference day we gathered there to celebrate. Practically it meant we just drank tea, made silly jokes, laughed our hearts out, and prayed for the wifi-connection. But we loved it. And that was when I learned. At these endings I learned about the start. I learned that it’s easy to make a promise to yourself, to promise yourself that you want to be open and sincere about who you are and the truth that’s alive in your heart. But it’s worth nothing if there is nobody to share it with. It’s worth nothing if there’s no one who’s willing to dare to do the same. To grow to greater highs in a collective is possible in several ways. But if you want to make it beautiful and rich. If you want to make it sustainable and sunny, you need each other. You need people in it that are all willing to doubt themselves, to cherish their talents, to celebrate their background and to share it for beautiful causes. And I was lucky enough to be in the company of such people. In that ‘Ohhvis‘ at the end of every conference day. So. Where do we start to create a Healthy planet? We start with us. All in a different place. A different time. All on different steps in our life. But with an honest and open heart. To who and where we are. Sometimes in small villages in the middle of the Himalaya. Sometimes in a metropolitan city with millions of people. Sometimes surrounded by money, sometimes with nothing else than nature. Sometimes in a cold climate covered with snow. Sometimes in a capitalistic world full of gadgets. Sometimes in war. Sometimes in peace. But we can manage to create this Healthy world for us and our children, if we all start with a simple ‘Hello’ and the courage to share who we are and where we come from.